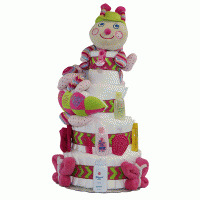 Here's a delightful and practical baby gift for a newborn baby girl. 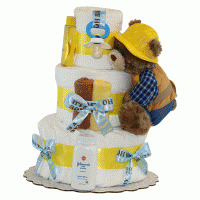 It's our 3-Piece Bath and Bib Gift. 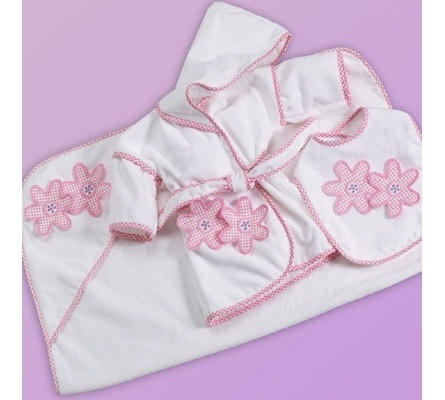 The set includes a Hooded Towel, Hooded Cover-up (18 mos.) and full size Bib, all beautifully embellished with our "Two Daises" dimensional applique/embroidery. Each item is made from matching premium quality USA terry fabric, and cut, embroidered and sewn domestically. So when you "pick these daises" you not only will be giving a wonderful baby gift, you'll be helping the economy by purchasing a Made in the USA product! Note: this set can be personalized. 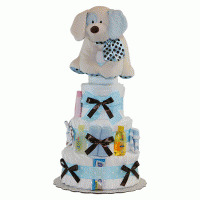 Please see personalized gifts.